Is your pet the adventurous type? Do you often catch them whistling the theme tune to "The Great Escape" whilst trying to look innocent? Are they regularly found exploring the neighbourhood for treats when they should be safe indoors? It isn't cheap, this bit of kit - £75.00 or thereabouts, and £9.99 a month for the service. My initial, possibly rather judgemental thought was that that amount would buy you a decent amount of dog training, and wouldn't it be better to tackle the problem at source, and end up with a reliable dog, rather than chuck technology at it but still have the same basic problem: a dog that does its own thing rather than yours? Plus, you may know where your dog is with this thing, but knowing isn't the same as catching up with it. They can move faster than you can. Is what I am not. After hours waiting for daughter's broken wrist to be assessed after the plaster came off and x-ray came back clear, "It hurts," she said, as the doctor gently felt her wrist. So, back in plaster for 2 weeks, which is going to be interesting for her dance exams, particularly the one this Saturday. Daughter rather taken aback by having her expressions of pain taken so seriously. Was just a little taken aback when I found myself muttering to her, as we were at last released to go and ransom the car, "Can't you lie next time?" Spent much of my own childhood announcing firmly and with a perfect lack of truth that "NO, it did not hurt, and YES, I was fine," and then getting back on whatever bolshy pony had got rid of me. Besides battering my physical self, the falls obviously did serious damage to my sympathy bone. Must, must, must work on it. And doctors do know best. THEY DO. This post is not for the squeamish. Scroll on, scroll on - click down to the post on Jill if rot and decay worry you. Yesterday I read something, somewhere (could have sworn it was in The Times, but I can't find it now) about masses of food being thrown out because it is after its sell-by date, even stuff like apples. I guess it might be the way I was brought up, but I've always taken sell-by dates on some things to be purely advisory. Chicken, meat and fish I am very nervous of going over the sell by on and generally don't, and I don't visit our sell by horrors on visitors, but isn't when to eat an apple just common sense? 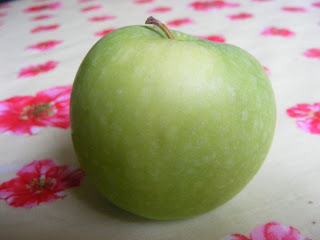 If an apple is still firm and unblemished, it's fine to eat. And even if it's started to go squishy, it will still make apple pie. If it's beyond that, the dog will eat it. In life, ponies get outgrown. 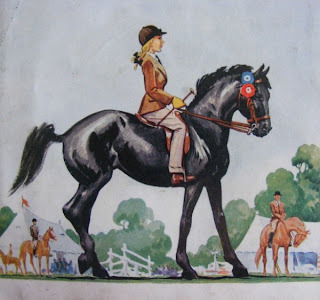 It was a great sadness in my life when I could no longer cram myself onto Dini, the Welsh pony I learned to ride on. In the pony book world, ponies get outgrown too: supply yourself with a large box of tissues and read Alyssa Brugman's latest, Greener Pastures. and here she is in Rosettes for Jill, at least four years older, but still on Black Boy. The hair style's changed, and she's now got a figure, but she's no taller. Her legs are just where they always were on the pony. I don't see anything wrong in age-branding, as long as it's discreet. The scheme as proposed by publishers at the moment isn't. You can tell the weather has perked up recently. 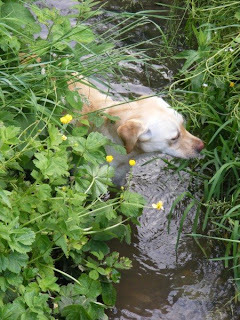 The dog has taken to plunging into the stream again. As far as we know, this is the first water she ever went into. When we got her, at the age of 15 months, she hadn't been walked for 6 months. We know she spent most of her early life in a yard. 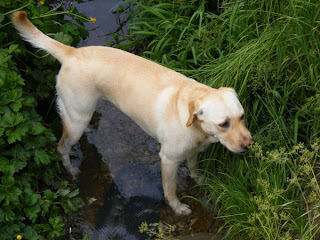 She first came across this stream when walking with my friend Dawn and her dogs. Truffle, a flatcoat, adores water, and plunged in. Holly quavered and quivered on the edge, torn between joining her friend and remaining safe on the bank. The decision was taken for her when she fell in. I've been tagged by Nigel, of Bagot Books, over at the Ibooknet blog (of which more later). I gather this is a meme. Someone did once kindly explain to me what exactly a meme was. My Oxford Handy Dictionary is silent on this point, and I can't remember what I was told, so will have a hunt round the Internet later and come back and explain. 1. Who’s your all-time favourite author, and why? Oh goodness. I always think if ever I am lined up against a wall and threatened with death unless I can come up with a favourite author, I will be splotted bloodily against the wall because I can never answer this. Firstly, sorry to those who commented on this earlier: I left it half finished before I went to meet daughter from the train, and thought I'd saved rather than published. Here is the full thing. There has been a lot of kerfuffle in the press and generally about many of the major publishers' decisions to age-band their children's titles from this autumn. These include HarperCollins, Penguin, Random House, Hachette and Scholastic. My first thought on reading this was that this isn't new. I remember reading Dragon books in the 1960s, which were divided into Blue, Red or Green dragon according to age, though the divisions: Blue Dragon - for young children, Red Dragon - for boys and girls - Green Dragon - for older boys and girls, (which does make me wonder in passing if Dragon thought children only developed recognisably as boys and girls after a certain age, but I digress) were pretty vague. 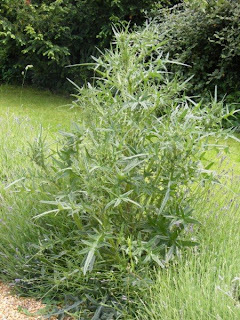 Here is my adorable thistle, in what is supposed to be my lavender hedge. I hate wearing gardening gloves, and by the time I got to this thistle, when it was a seedling, it was too spiky to be tackled with bare hands. So, I left it. And left it. And left it. Yesterday evening I finally strapped on my gloves and dealt with it. If it had been in the borders, I think I would have left it: it's so splendidly vicious. But what's in their heads? I have just dropped my son off at the station to go to what we all hope is his last ever Maths exam. He has a horrible week this week: 8 GCSEs, and most of them the hefty ones - nothing fluffy at all. One of his exams is English Literature. Son and a friend were talking about their respective Eng. Lit exams over the Half Term. "How is the quotation learning going?" I asked. They looked at me blankly. "Ma, we take the books into the exam," said son, gently, to a mother he knows is old and incapable. Seeing my look of horror, friend added, trying, to cheer, "The books have to be clean!"